Mother! Oh God! Blood, mother! Blood! PSYCHO. What more can be said? Without this 1960 classic, many of the other horror movies featured on this site would not have followed. This one film not only sowed the seeds for the modern slasher, but more importantly, it heightened the stakes for modern thrillers and suspenseful scenarios. For the common moviegoer, it provoked a genuine interest in (if not outright study) of abnormal psychology. Filmed on a small budget and with a television crew, Alfred Hitchcock created a masterpiece with his PSYCHO and ushered the horror film into the modern era of terror. Volumes have been written about this movie, it's marvelous cast, and much imitated soundtrack by Bernard Hermann. From the perpendicular imagery of cranes, window slats and the opening credits, to the repeating images of mirrors throughout the movie, people have found countless ways to watch this classic over and over again. Imagine a movie in which it's star is violently killed midway through the movie... brilliant! Janet Leigh stars as Marion Crane, a bored Phoenix, Arizona secretary who wants to marry Sam Loomis (John Gavin). When a brash millionaire leaves forty thousand dollars in cash at the real estate office where Marion works, her boss tells her to deposit the money in the bank. In the parlor, Norman and Marion talk about his mother, with whom he lives in the house adjacent to the motel. That evening, as she is taking a shower in her room, Marion is suddenly attacked and stabbed repeatedly by a person who appears to be Norman's mother. Moments later, a horrified and shocked Norman discovers the bloody scene and covers up the crime. He cleans up the bathroom and puts Marion's corpse in her car, then sinks it in a swamp along with the stolen money...which he is unaware of. An insurance detective named Arbogast (Martin Balsam) attempts to find Marion and winds up at the Bates Motel. He too is murdered - again apparently by Mrs. Bates. Marion's sister Lila (Vera Miles) then joins Sam in the search. They learn from the local sheriff that Mrs. Bates has been dead for years. At the motel, Sam tries to keep Norman occupied while Lila ventures into the house next door. Norman becomes suspicious and knocks Sam out. Meanwhile, Lila stumbles upon a horrific sight...the mummified corpse of Mrs. Bates. At that moment, a figure appears with a knife and lunges at her. But Sam appears just in time and subdues the killer. A wig falls to the ground and we see that it was Norman all along. In closing, Sam and Lila (and the viewers) get a summary of Norman's mental state and of the crimes that have been committed. Norman, in a fit of jealous rage, killed his mother and her lover years before. Out of loneliness and the guilt of matricide, Norman preserved his mother's corpse. But that wasn't enough. Norman assumed the "identity" of his mother, her voice, her actions, her strict ascetic beliefs. This dual role-playing stuck in Norman, we're told, and he became two people. The murders were committed by the "Mother" side, while Norman was left to find the mess, clean up - and hide the evidence. There are some interesting facts about this classic. The Bates Motel was built on the backlot of Universal Studios, and cost only $15,000. It was assembled using pieces from leftover sets. Several actresses were considered for the role of Marion Crane, including Lana Turner and Piper Laurie (the future Mrs. White in Carrie), but budgetary restrictions narrowed Hitchcock's list. As for another "part", the director came up with an ingenious ploy by spreading rumors about who would play Mrs. Bates! Names such as Helen Hayes and Judith Anderson were mentioned, and Hitchcock soon found himself swamped by older actresses eager to tackle the nonexistent role. The 45 second shower scene required over 70 camera setups and 90 editing cuts, with chocolate subbing for the blood. The filming of the scene took 7 days. For the sound effects, Hitchcock used a knife stabbing a melon, which would become standard practice for most future slasher films. During the filming, Hitch devoted much of his time to detail, but he missed one thing. It took his wife Alma to point out that in the original cut, Janet Leigh could be seen blinking after her death. The error was quickly corrected. The figure that attacks Marion Crane is not Anthony Perkins, who was away from the set that day. A stand-in was used instead. PSYCHO was truly Hitchcock's most intimate audience-interaction creation. Janet Leigh has said "the brilliance of PSYCHO was that your imagination was allowed to flourish." "Today, you don't have to use your imagination; they show you everything. I think the new horror films are not as good. Your imagination is much stronger than anything that they could graphically depict." From the masterful editing of the shower scene montage (in which the knife never directly enters Leigh's flesh), to the quick-cut editing of Arbogast's demise in the Bates house on the hill, Hitchcock meticulously devised a film which "suggested" the individual horror within the minds of each audience member. In addition to not allowing PSYCHO any pre-release screenings for critics, Hitchcock pulled one of his most famous publicity stunts by not allowing the audience to enter late. All moviegoers lining up in 1960 to see the picture were required to sit through it from the very beginning. This gimmick was created so that the structure of the movie (and it's secret) was held intact. Hitch was serious about this. Paramount Studios even hired uniformed Pinkerton guards to enforce the rule. 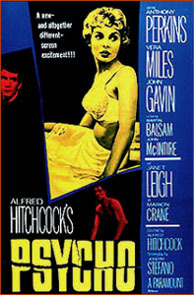 After the release of PSYCHO, Hitchcock received a letter from a man upset because his wife refused to take baths after seeing 1955's Diabolique, and now had begun to shun showers after seeing PSYCHO. Replied Hitchcock, "Send her to the dry cleaners." This film works on the level of a straight drama, as well as a horror flick, complete with scary images, lighting, and some of the most identifiable "Hitchcock" camera angles. It is also one of the most thoughtfully planned thrillers in terms of dialogue, plot, and climax.